Caraselle Direct – Home Accessories Products Buy wide range of hamming tap and wundaweb for easy without sewing. School Uniforms, Sports Kits (and their own clothes) can be expensive to buy, especially when you have more than one to buy for, so now that it’s time to think about getting them ready for going back to school, make sure you take steps to keep their uniform in tip-top condition, and that means caring for them, whether repairing or washing. We aren’t all expert sewers and most of us don’t enjoy the task of hemming skirts or trousers in preparation for school. So make your life a bit easier by using Wundaweb Easy Hemming. Available as Wundaweb Easy Hemming Regular or Wundaweb Easy Hemming Extra Strong for heavier fabrics. It means easy hemming without sewing, to give secure invisible hems in seconds! It’s perfect for hemming skirts, trousers, dresses and much more. 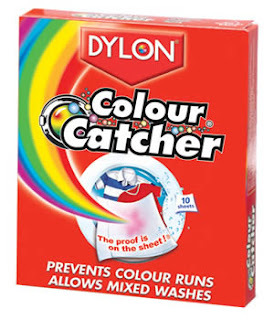 To prevent disasters when washing the uniforms or sports kits use a product such as Dylon Colour Catcher®. Dylon are colour experts and when you need something done properly you go to an expert don’t you? So how will this help you? If you want to make sure the whites in their shirts stay white and your colours stay bright, but you also want to save time by mixing the wash then this is essential. Normally every time you wash bright or dark coloured clothes, traces of dye bleed into your laundry. These dyes may completely ruin your wash or leave your clothes with a dull, grubby appearance. Colour Catcher® is a treated anti‐transfer sheet with special ingredients which act like a magnet, removing loose dyes and dirt during the washing process. Now you can wash with confidence, prevent discolouration to your laundry and keep your colours bright. We are always short of time and using Colour Catcher® means you can mix your coloured and white clothes together so reducing the need to separate clothes prior to the wash and therefore the amount of washes needed… which saves you time and money. Keep Colours bright and Whites white!